Cycling is both a fun and excellent way to improve overall fitness. It can solve the headache of everyday commuting, as well as provide some of the road thrills and challenging gradients that have made the Tour de France, one of the blue ribbon events of world sport. For those who prefer exploring beautiful off-road terrain and covering themselves with mud as well as glory mountain biking is ideal. The past 30 years have seen this form of cycling rise rapidly in popularity, to the extent that the wide, chunky tyred machines purpose-built for the sport can be seen in parks and roads around the country. Quite simply, mountain biking has caught the imagination of millions. Of course, given the sort of terrain that a rider can encounter, the safety issue surrounding mountain biking must be taken seriously. Not only does a rider need to be well versed in how to handle their machine and deal with challenges such as steep downhill gradients, mud, fallen trees, water hazards and vegetation, they have to be properly equipped, too. This means a certain level of investment must be made. For a start, off-road terrain can’t be tackled with a racing or city bicycle. A specialist machine must be acquired, and one that is suited to the physique of the rider. The same rule applies to equipment, such as a helmet, goggles and water-proof clothing that will protect the rider from the worst the elements can throw at him or her and also the impact with the ground if they are thrown from the saddle. 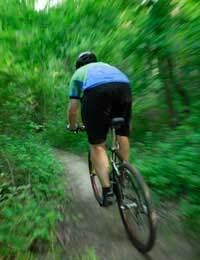 A good way to get started in mountain biking is to join a local club. Not only will you have access to coaching in the sport but you will benefit from access to where and when organised events are being held. Then there is the advantage of being surrounded by fellow enthusiasts who can offer help and advice on all aspects of the sport. It’s also a great way to make new friends. For information on your local club, a good source on the net can be found at the site of Britain’s governing body for cycling, www.britishcycling.org.uk. The site also lists both national and international events that testify to the profile of the sport in the 21st century. There has been an enormous investment in cycling in the UK. This is to encourage the public to use different modes of transport that are much more Eco-Friendly. Therefore cycling and mountain biking carries high priority as it has zero emissons. They also encourage you to get out and about, and helping young and old stay fit and healthy! These facilities, in turn, may inspire you to take one of the many biking holidays that are now offered by a range of specialist operators for both individuals and groups. For example, a mountain biking break can make for an ideal family holiday, ensuring that adults and kids have a great deal of fun and improve their fitness at the same time.